I understand Congressman Newhouse is inviting comments today from stakeholders regarding increased spill and other issues related to federal dams in his district. While I am not a constituent, that is a resident of his district, I am a stakeholder since I am a rate and tax payer. In addition, my background as a civil engineer retired from the US Army Corps of Engineers, which included three years as the Deputy District Engineer for Programs in Walla Walla, gives me more than average understanding about the cost and policies of operating large projects. I should also point out that since briefing the Congressman in January of 2015 about the costs and benefits of the lower Snake River Dams I have invested well over 6,000 hours of my time digging into the thousands of pagers of documents and data to unravel the truth about these dams. Knowing what I do it pains me to see our elected officials, the public and even agency heads fall for the misleading arguments about the pros and cons of these four dams. These argumentative statements developed primarily by special interest groups, lobbyist and trial attorneys on both sides of the argument are now so convoluted as to make no sense whatsoever. For instance, will more spill recover salmon? No. Will it cost BPA a lot of money? No, given the loss of money the four lower Snake River Dams incur nearly every day and the overall financial hemorrhaging of BPA, BPA would more likely save money with more spill. Will transporting more fish lead to salmon recovery? No. Will the billion dollar investment made since 2000 on passage improvements on the 4LSRD’s lead to salmon recovery? No. Have these investments and other expenditures for the 4LSRD’s diverted funds from other more important dams in the Federal Hydro System? Yes. If the 4LSRD’s are breached, will it have devastating economic effects in eastern Washington? No. 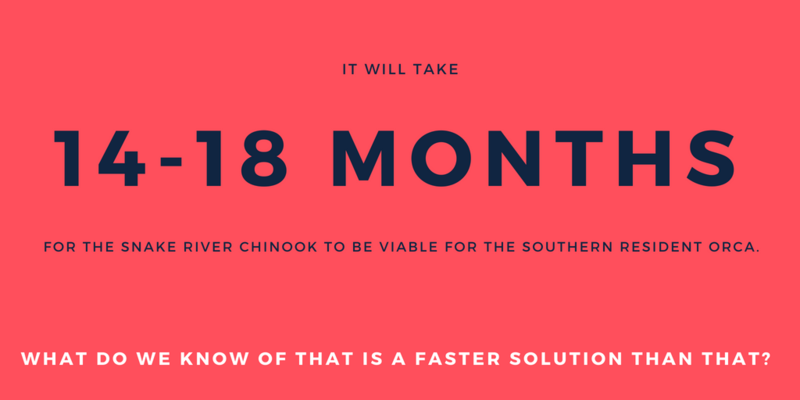 Indeed it will lead to several thousand new jobs and over $500 million per year in direct and indirect economic benefit to the six counties adjacent to the lower Snake River. Will irrigation farmers along Ice Harbor pool be left high and dry with worthless land? No. Is the Corps restricted from taking immediate action now by on going Biological Opinion litigation? No. I could go on. Instead I offer a letter I have written to my neighbors in eastern Washington that asks and expounds on these and other important issues concerning the benefits, or not, of the 4LSRD’s. 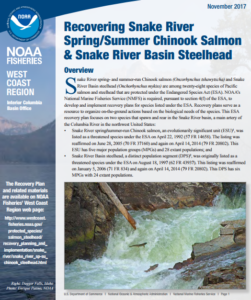 It is attached, along with two short summaries concerning the economics and salmon status on 4LSRD’s and a paper that describes how existing policies within the Corps and BPA provide the means now to benefit virtually all stakeholders when a free flowing river is returned to the lower Snake valley. I respectfully request that these documents be entered into the discussions. I am available for questions and will also be asking for a meeting the next time I am in the area. How do you remove THAT? What will it take to remove the four lower Snake River dams and restore access for salmon to, and from, 5,500 miles of spawning habitat? Will it require Congressional approval? A federal court order? Both would take many years, but the dams must be removed much sooner. 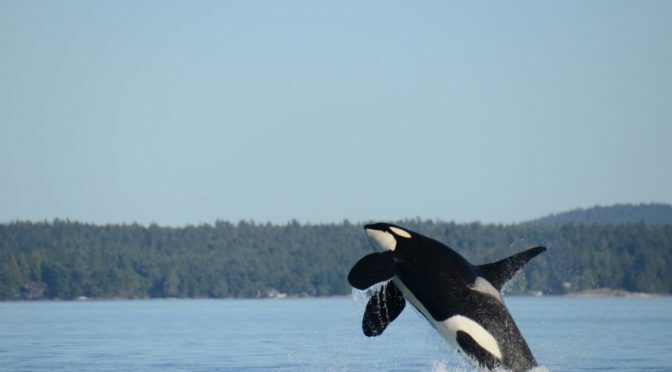 Not only are the river’s ESA-protected salmon on the cusp of extinction, but those fish are desperately needed now to avoid extinction of the culturally unique and much beloved Southern Resident orcas. Thankfully, the real answer is a much shorter route. A panel discussion about the Elwha and the Snake rivers, called A Tale of Two Rivers, took place at the Burke Museum January 24th. Most likely all of the over 200 salmon and orca advocates in the room, including the panelists, saw the urgency to remove the Snake dams, but the only two options offered by the panel were either to ask our dysfunctional Congress for permission, or wait a decade or more for a new federal court order, which requires a new BiOp, and a new EIS, then new litigation, etc. That authority was clearly stated in a January 2017 letter from then Assistant Secretary of the Army Ellen Darcy, who wrote: “the Army Corps is committed to following the guidance in the 2002 FR/EIS as a framework for its actions, which includes ongoing assessments as to the efficacy of the alternatives it has implemented to date; the results of those assessments will inform our next steps…” That 2002 Environmental Impact Statement (EIS) still determines mitigation efforts, but after billions have been spent the salmon are still disappearing. Indeed, the EIS states that Alternative #4, breaching the dams, provides the only opportunity to recover Snake River salmon and steelhead, but it wasn’t chosen by the Corps. Federal judges have reminded the Army Corps five times that they are required by the Endangered Species Act to cease harming endangered salmon to the verge of extinction. Tribal Treaty rights also demand salmon conservation. The Corps also has a fiduciary responsibility to fund only economically beneficial projects, but the four dams are losing money, returning only 15¢ for every $1 invested by taxpayers and ratepayers. Irrigators and grain shippers can stay in business with a tiny fraction of the money saved by dam removal. When the panel ended we were left with two convoluted, confusing and disheartening paths to Snake River dam removal, both inaccurate and impossible to achieve in time to avoid extinction of endangered Snake River salmon and Southern Resident orcas. It is our responsibility to tell our political leaders to urge the Army Corps to proceed with dam removal immediately. On Tuesday, January 30th, 2018, Bonneville Power Administration (BPA) announced that it would be cutting funding for fish and wildlife programs. BPA has been in a death spiral lately. It would rather defend the dams to the death than admit that it’s wrong. For a closer look into the reasons why, read Linwood Laughy’s recent article on the subject. How much has BPA spent on fish and wildlife in the past several decades? The answer is here in their letter to Congresswoman Cathy McMorris Rodgers. With all this spending, how are the salmon doing? Finally, how can the BPA problem be solved? How can it save itself? The solution is actually quite simple. It would allow the agency to not only save itself, but also save Snake River salmon, steelhead, and Southern Resident Killer Whales. According to the Idaho Department of Fish and Game, in the 1950s and 1960s, 40,000 B-run steelhead crossed the Washington Waterpower dam near the former Potlatch mill at Lewiston. Sawmill workers were known to catch steelhead on their lunch breaks. That was before the four lower Snake River dams existed. After dam construction, steelhead numbers plunged. In 1997, the U.S. Fish and Wildlife Service declared these fish in jeopardy of extinction. In 2017, fewer than 1,000 wild B-run steelhead will pass Lower Granite dam and head up the Clearwater River, a decline of 98 percent. During the past 20 years, electricity rate payers have provided Bonneville Power Administration billions of dollars to help Snake River salmon and steelhead runs recover. 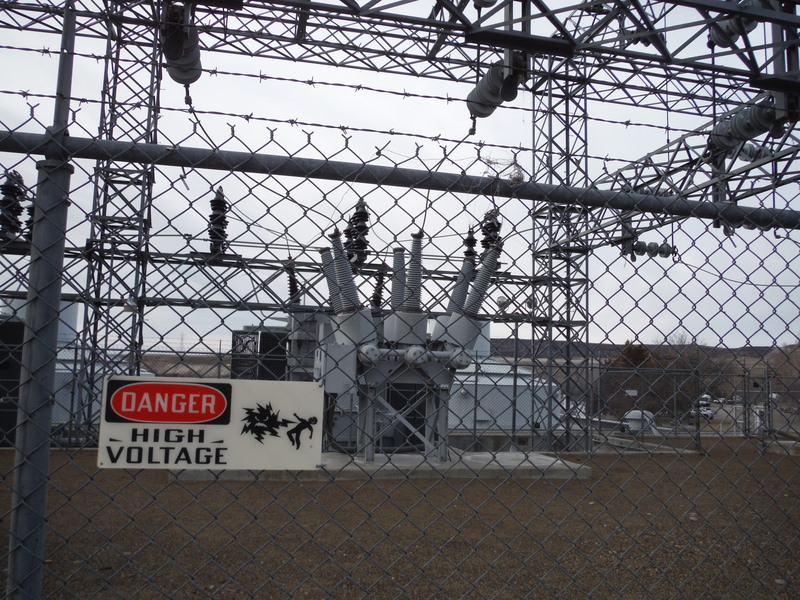 Recently, BPA raised its electricity rates another 5.4 percent for a total of 33 percent over the past few years. 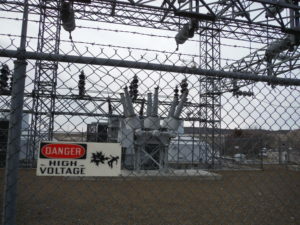 The agency states that 33 percent of its cost of production is mitigation for the damage the hydro system does to fish and wildlife. Our local electrical providers pass this cost on to us. None of the four threatened or endangered Snake River salmon or steelhead species is on a path to recovery. Just 159 Snake River sockeye salmon returned to Idaho in 2017. We are all being scammed. Tax dollars continue to be a key component of the Port of Lewiston’s budget. The port had an operating loss of $134,220 in the fiscal year that ended June 30 for its dock, rental properties and warehouse, but a net income of $478,620 counting revenue from property and sales tax that totaled more than half a million dollars for the same time period. The figures come from an audit that was released at a port meeting Wednesday. The port has experienced operating losses since fiscal year 2013, when the loss was $92,435. Losses peaked last year at $501,234. The last time the port’s dock, rental properties and warehouse showed earnings was in fiscal year 2012 when they reached $280,509, largely because of revenue from megaloads. Among the largest expenses in the calculation always is depreciation, which was about $400,000 in fiscal year 2017. Depreciation has to be deducted as infrastructure ages, but it doesn’t represent actual dollars going out the door. 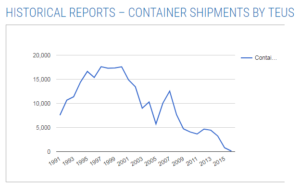 The port has faced a number of financial challenges in recent years after container shipments between Lewiston and Portland halted. Shipments of cargo such as dried peas and lentils had been a significant source of income. The port’s operating loss was smaller in fiscal year 2017, though it still did relatively little business at its dock. The port spent less on property development and received a refund from the city of Lewiston on the 18th Street North road project. It sold rock that had been intended for a Regence expansion planned for more than a decade ago that eventually happened on the insurance provider’s existing Lewiston site. Overall, the port’s net position climbed from $24.3 million in fiscal year 2016 to $24.8 million in fiscal year 2017. Those numbers include the port’s savings and capital assets. Heard a report from manager David Doeringsfeld about railroad repairs. The port spent $59,000 to fix its train tracks in recent months, compared with the $5,000 to $6,000 that was budgeted. The money went to replacing ties on at least one tight corner as well as rehabilitating a bridge and a railroad crossing. The port anticipates the amount it spends on railroad maintenance will be higher in the next several years, partly to accommodate higher volume. Trains, for instance, are transporting products of a dried pea and lentil processing operation. Heard an update on the removal of an uninhabited homeless camp on port land in North Lewiston. The demolition cost $4,300, with the expenses being split about equally between a contractor that took out makeshift shelters and disposed of trash. The project eliminated a fire hazard, said Commission President Mike Thomason. The contractor contoured the dirt to blend with the terrain, and grass will be planted in the spring, Doeringsfeld said. The federal government released in-depth recovery plans for Snake River spring and summer chinook, fall chinook and steelhead Tuesday – the first such plans completed since the fish were placed under Endangered Species Act protections more than 20 years ago. The documents are blueprints that lay out the types of actions needed to increase the abundance and productivity of the ocean-going fish to the point they are self-sustaining in the wild without the need of federal protection. It is likely to take decades, perhaps more, and cost hundreds of millions of dollars above and beyond what is already being spent, according to the documents. Dam breaching is discussed as a possible future action that could help juvenile and adult salmon and steelhead survive their journey to and from the ocean, but it is not listed as a key strategy. Instead, the plans rely on things like continuing efforts to improve spawning and rearing habitat, reforming hatchery and harvest practices, reducing predators and taking actions to mitigate habitat degradation because of climate change. The actions are largely voluntary. The plans say survival and abundance of the fish has increased as a result of several steps the region has already taken over the last two decades, including habitat work, the installation of weirs at the dams that allow juvenile fish to more easily find their way downstream and a host of other actions. But in the case of steelhead and spring and summer chinook, it says much more work is needed. “The challenge is greater to recover spring and summer chinook and steelhead,” Troyer said. “They spawn farther up in the tributaries and they are vulnerable to habitat damage and climate change. Fall chinook are closer to recovery. The government said it likely will follow a recovery strategy that doesn’t require the species to be re-established above the Hells Canyon Complex of dams. Thanks largely to efforts by the Nez Perce Tribe to boost wild numbers with hatchery releases, fall chinook returns have increased from less than 100 at the time they were listed to returns of wild fish in recent years that have numbered more than 10,000. “It demonstrates we are really on track to recover that species,” Troyer said. However, federal fisheries officials say too many hatchery fall chinook are spawning with wild fish, and the places hatchery fish are released likely will have to be altered. Tom Cooney, a research biologist with the NOAA Fisheries’ Northwest Fisheries Science Center at Portland, said hatchery fish should be excluded from the Snake River upstream of its confluence of the Salmon River in Hells Canyon. Though the plan will focus on recovery of fall chinook without reintroduction above Hells Canyon, an alternative that would require restoring fish above the Idaho Power dams is being retained. While dams are identified as a key limiting factor for the fish, Graves said dam removal is not outlined as a concrete action because too much scientific uncertainty exists as to its effectiveness. About 50 percent of juvenile fish survive their journey through the eight-dam hydropower system now. But he said removing the dams may or may not boost survival to a significant degree. He pointed to taking actions aimed at reducing the effects of climate changes as a better strategy. For example, he said adult spring and summer chinook that return to the Snake River basin must survive in tributary streams through the hottest part of summer before spawning. Their offspring also have to survive in the same streams. Habitat work like reconnecting streams to floodplains and increasing shade through the planting of riparian trees and shrubs can help mitigate higher water temperatures brought on by climate change. Graves said if you increase survival at the dams through breaching or additional spill, it won’t pay dividends if spawning streams are overheated. Others see it the opposite way. Michelle DeHart, director of the federal Fish Passage Center at Portland, said it’s clear that juvenile fish that pass the dams through turbines or bypass systems rather than going over spillways survive and return at lower rates. Sometimes they die at the dams, but studies conducted at the center indicate the fish often succumb later – known as delayed mortality – as a result of stress and injuries while passing the dams. 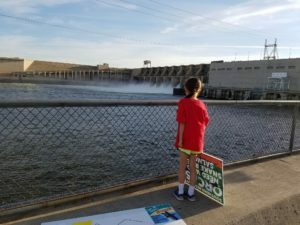 While habitat work is important and may lead to more juvenile fish leaving Idaho, she said they still face major challenges at the dams. The recovery plans are broader in scope than biological opinions that look at federal actions – such as operating the hydropower system on the Snake and Columbia Rivers – to determine if they threaten the existence or habitat of protected species. Federal biological opinions on Snake and Columbia river dams have received intense scrutiny over the past two decades and have been the subject of successful lawsuits filed by the Nez Perce Tribe, state of Oregon and salmon advocates that forced the government back to the drawing board. Last year, District Court Judge Michael Simon at Portland overturned the government’s latest biological opinion and required the agencies that operate the dams to conduct an exhaustive environmental impact statement outlining their effects on the fish. That separate process is scheduled to wrap up in 2021. In 2017 the fish returns at Lower Granite dam are down for all categories compared to both the 10 year average and 2016. A total of 142,527 salmon and steelhead returned to Lower Granite Dam in 2017, a 35% reduction from 2016, which followed a 33% reduction from 2015 to 2016. These precipitous declines should come as no surprise. They were predicted in the 2015 Salmon White Paper which was distributed to Pacific NW state representatives as well as federal agency representatives. Five-year reviews by NOAA show minimal improvement in the risk-status of ESA-listed salmon and steelhead despite a billion taxpayer dollars being spent on system improvements. Current NOAA recovery plans are predicted to NOT achieve fish recovery. Pacific NW state fisheries reports show that smolt-to-adult ratios have not improved either and still show Snake River fish returns are not meeting criteria for species survival. Snake River wild steelhead are on a decline to levels not seen in 20 years. Adult returns in 2017 will mark the second steepest 5-year trend since the 2009-2013 trend. The third worst 5-year trend will be from 2002-2006 adult counts. This recent 5 year trend is so low that it will hit a trigger point in the 2014 biological opinion. The BiOp states that the agencies must implement a solution within 12 months. However, the downward trend is not the only problem; the actual number of wild steelhead is now so low that the only solution or recovery action that can be implemented quick enough to prevent virtual extinction is the breaching alternative in the existing EIS for the 4 Lower Snake River dams. Run declines of other species point to 2018 breaching as well. 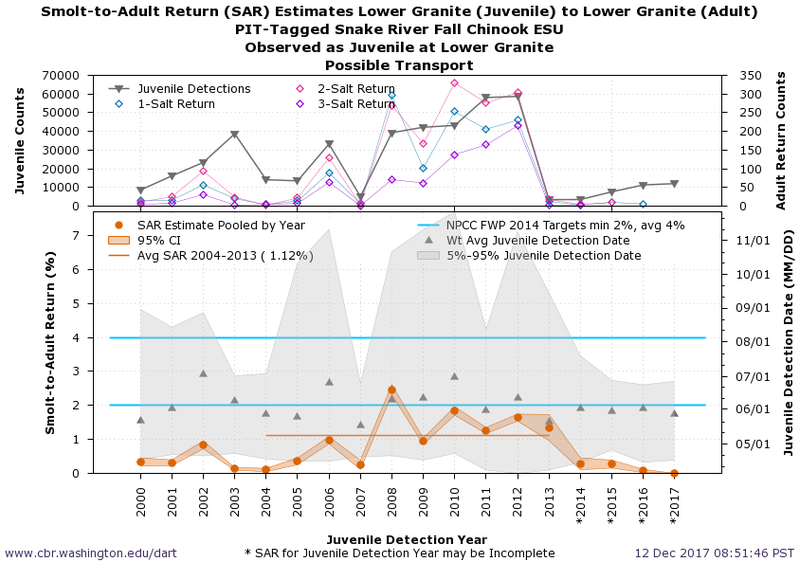 SAR (smolt to adult return ratio) is a measure of fish survival, or the % of smolts that return as spawning adults. The Northwest Power & Conservation Council’s goals are 2% for mere survival of the species and 6% for recovery of the species. Overall, Snake River Chinook and steelhead SARs have only been above 2% in 5 of 20 years in recent history (and never above 6%). These results are in spite of increased spill and barging around the dams. 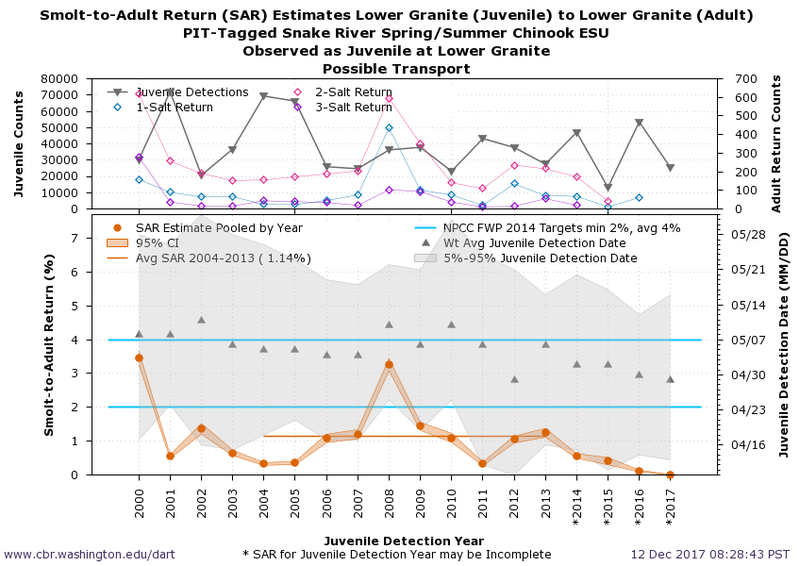 In contrast, Mid-Columbia Chinook and steelhead are generally meeting the NPCC SAR goals and have SAR ratios 2.3X – 3.4X greater than Snake River wild SARs. Keep in mind that Snake River salmon and steelhead pass over 8 dams… 4 on the Columbia and 4 on the Snake. Mid-Columbia fish only pass 1- 4 lower Columbia dams. If the 4 lower Snake River dams were removed, Snake River salmon and steelhead would have very similar migration and spawning conditions, which should lead to fish recovery. See charts below for trend of SAR’s below 1. *At the dams, river transit time unaffected. This is not recovery either….